The cupcakes are very simple to make and the chocolate nests on top are a nice messy activity for the kids to get involved in, if so desired. You could even have a family competition as to who can make the best nest. Stork have produced this handy step-by-step demonstration to the recipe for easy to follow instructions. Unusually for me, I followed the recipe nearly exactly. The only change I made was to use cardamom flavoured golden caster sugar. I have a jar of sugar with cardamom pods sitting in it permanently on the go. It adds a delicate but noticeable aromatic note that works well with many cakes and biscuits. Using Stork margarine not only made the cakes extremely light, but made the preparation process really speedy; no need to wait for butter to soften and everything can be mixed together in one fell swoop. A bird’s eye view. Well it is Stork! The fun bit came with making the nests to go on top of the cakes. 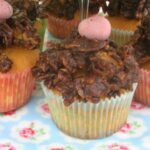 I doubt there’s an adult out there who doesn’t have fond childhood memories of chocolate cornflake cakes. Do tell me it’s not just me? My cakes rose far too well and didn’t come out of the oven with flat tops. I should have done the sensible thing and cut off the volcanic eruptions in the middle, but I didn’t. As a result, my nests were more like eagles eyries, just about clinging on to the precipitous crags and the single eggs I managed to attach looked somewhat precarious. Despite this, or maybe because of it, I felt ridiculously pleased with my Easter Nest Cupcakes. I took them with me to an Easter gathering my mother was hosting and it was gratifying to see the delight on people’s faces when they got a glimpse of them. Luckily I received appreciative comments in between the crunching and munching. Wishing everyone a very Happy and chocolate filled Easter. Easter Nest Cupcakes. PIN IT. Simple but effective Easter cupcakes for all the family to enjoy - in the making and in the eating. Place all cake ingredients in a mixing bowl and beat until well mixed. Spoon in to 12 muffin holes lined with paper cases. Bake in preheated oven 190°C, 170°C fan, Gas mark 5 for 15 -20 minutes when the cakes should be well risen and golden. Place on a wire rack to cool. For the chocolate nests, gently melt the Stork and syrup in a pan. Stir in the chocolate and cornflakes. Place a tablespoon of mix on each cupcake and shape into a nest. Leave in a cool place to set - about half an hour. 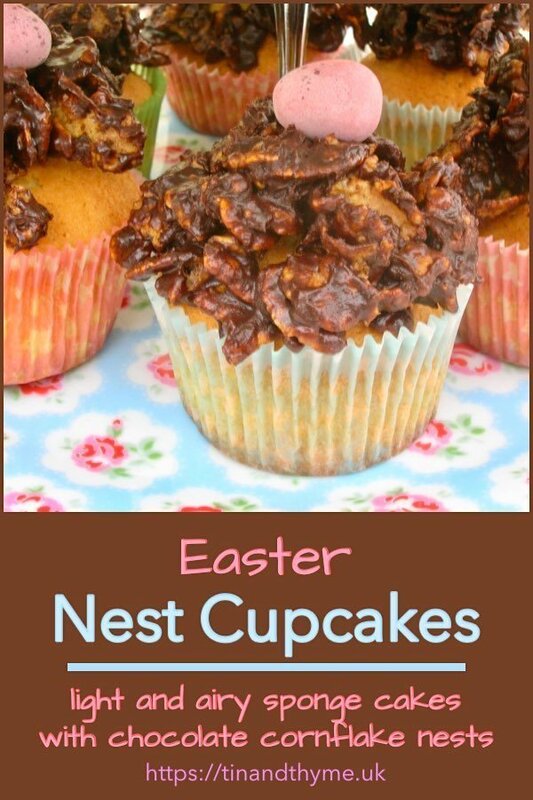 Place the nests on top of the cooled cakes and fill with mini eggs. As Easter heralds the true coming of spring, I am sending these Easter Nest Cupcakes off to The Baking Explorer and CakeyBoi for Treat Petite. For the same reason, these are also going to Ness at JibberJabberUK for Love Cake where the theme is Step into Spring. This is a sponsored post, although all words and images are my own except where stated. These look really easy to make – I reckon even I could do reasonably well! Interesting to read you are in Cornwall – my parents are from Plymouth and all my ancestors are Cornish. Hope you’re enjoying Poldark! They sound good too Stepahine, cream cheese frosting can be delicious. These look like lots of fun. I regret to say that I didn’t have cornflake chocolate treats as a kid – we had heaps of chocolate crackles which are made with rice bubbles/rice krispies. I did make your hidden egg marzipan cupcakes (and posted today) – they are amazingly good. Thanks. Oh well Johanna, rice krispie cakes are nearly as good 😉 I’m coming over right now to see how you got on. These are so very cute and really pretty. I am sure they would make a perfect teatime treat for Easter. Easter Nest cakes of any type are great for Easter and these are a nice mix of proper cake and no bake cake, can’t do better than that. Thanks Janice. 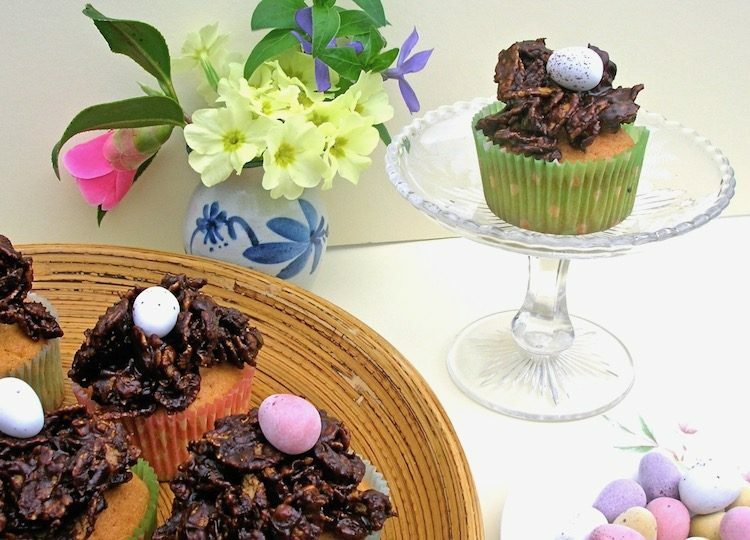 When I was living at home as a teenager, I always decorated the Easter Simnel cake with chocolate nests, sometimes made out of cornflakes and sometimes out of shredded wheat. I normally just have vanilla sugar on the go so will definitely try a cardamom one as well. And crispy nests on top of sponge cakes just sounds dangerously moreish. I have vanilla sugar too Tracy, but I use my cardamom sugar more. Thanks Elizabeth, I wouldn’t be without my jar of cardamom sugar. We’ve had a great Easter weekend thanks, the weather has been wonderful. Hope you’ve had a good one too. Thanks Sylvia. We’re having a lovely Easter thanks, hope you are too. These are so sweet aren’t they Choclette and I loved the challenge too! They are cute and everyone loved them and they were fun to do too Karen. Thanks Helen and yes it’s a good mix, everyone gets something they like. My nan always used Stork and my mum and I have followed her example. I love the twist of adding the chocolate nests on top of the cupcakes.